Oamaru (/ˌɒməˈruː/ ( listen); Māori: Te Oha-a-Maru) is the largest town in North Otago, in the South Island of New Zealand, it is the main town in the Waitaki District. It is 80 kilometres (50 mi) south of Timaru and 120 kilometres (75 mi) north of Dunedin on the Pacific coast; State Highway 1 and the railway Main South Line connect it to both cities. With a population of 13,950, Oamaru is the 28th largest urban area in New Zealand, and the third largest in Otago behind Dunedin and Queenstown. The name Oamaru derives from the Māori and can be translated as "the place of Maru" (cf. Timaru). The identity of Maru remains open to conjecture. There are some important archaeological sites around Oamaru. Those at the Waitaki River mouth and at Awamoa both date from the Archaic (Moa-hunter) phase of Māori culture, when New Zealand's human population clustered along the south-east coast from about AD 1100. The Waitaki River mouth had at least 1,200 ovens. Awamoa saw the first archaeological excavation in New Zealand when W.B.D. Mantell dug there at Christmas 1847 and in 1852. Smaller Archaic sites exist at Cape Wanbrow and at Beach Road in central Oamaru. The distinctive Archaic art of the Waitaki Valley rock shelters dates from this period — some of it presumably made by the occupants of these sites. The area also features Classic and Protohistoric sites, from after about AD 1500, at Tamahaerewhenua, Tekorotuaheka, Te Punamaru, Papakaio and Kakanui. Māori tradition tells of the ancient people Kahui Tipua building a canoe, Arai Te Uru, which sailed from southern New Zealand to the ancestral Polynesian homeland, Hawaiki, to obtain kumara. On its return it became waterlogged off the Waitaki River mouth, lost food baskets at Moeraki beach and ended up wrecked at Matakaea (Shag Point) where it turned into Danger Reef. After the wreck a crew member, Pahihiwitahi, seeking water, discovered the Waitaki River, but on returning south and failing to reach the wreck before dawn he was turned into a hill in the Shag Valley. Modern academics have suggested this tale is an allegorical explanation of the fact that kumara will not grow south of Banks Peninsula. On 20 February 1770 James Cook in the Endeavour reached a position very close to the Waitaki mouth and "about 3 Miles [5 km] from the shore" according to his journal. He said the land "here is very low and flat and continues so up to the skirts of the Hills which are at least 4 or 5 Miles [6–8 km] in land. The whole face of the Country appears barren, nor did we see any signs of inhabitants." He stayed on this part of the coast four days. Sydney Parkinson, the expedition's artist, described what seems to be Cape Wanbrow, in Oamaru. On 20 February he wrote "...we were near the land, which formed an agreeable view to the naked eye. The hills were of a moderate height, having flats that extended from them a long way, bordered by a perpendicular rocky cliff next to the sea." Some of the [local] people [had been] absent on a feasting expedition to meet a great party from Taumutu, Akaroa, Orawenua [Arowhenua]. They were returning. The [sealers'] boat passed on to the Bluff 8 miles [13 km] north of Moeraki where they landed & arranged their boat – & lay down to sleep in their boat. At night Pukuheke, father of Te More, went to the boat, found them asleep & came back to the other Natives south of the Bluff. They went with 100 [men] killing 5 Europeans & eat them. Two of the seven escaped through the darkness of the night & fled as far as Goodwood, Bobby's Head, after being 2 days and nights on the way. Pukeheke's party killed and ate these as well. The Pākehā, a party from the Matilda (Captain Fowler), under the first mate Robert Brown with two other Europeans and five lascars or Indian seamen, made eight in all, not seven as the manuscript says. They had been sent in an open boat from Stewart Island in search of a party of absconding lascars. Brown must have had some reason for searching for them on the North Otago coast. After Te Rauparaha's sack of the large pa (fortified settlement) at Kaiapoi near modern Christchurch in 1831, refugees came south and gained permission to settle at Kakaunui (Kakanui), and the territory between Pukeuri and Waianakarua, including the site of urban Oamaru, became their domain. Whalers sometimes visited this part of the coast in the 1830s. The Jason, for example, probably of New London in the United States, Captain Chester, was reported at "Otago Bluff" south of Kakanui, with 2,500 barrels (400 m3) of oil, on 1 December 1839. Edward Shortland visited the area in 1844, coming overland from Waikouaiti. On 9 January he recorded "Our path to-day was sometimes along the edge of a low cliff, sometimes along the beach, till we approached Oamaru point, where it turned inland, and crossed a low range of hills, from which we looked over an extensive plain ... Towards the afternoon, we ascended a range of hills called Pukeuri, separating this plain from another more extensive. The sky was so remarkably clear that, from the highest point of the pathway, Moeraki was distinctly in view..." He made a map and placed Oamaru on it. He was one of several Europeans who passed through the area on foot in the 1840s. James Saunders became the first European resident of the district some time before 1850 when he settled to trade among the Māori of the Waitaki River mouth. More European settlers arrived in the Oamaru area in the 1850s. Hugh Robison built and lived in a sod hut by the Oamaru Creek in 1853 while establishing his sheep run. J.T. Thomson surveyed the place as a town in 1859, and the Otago Provincial government declared "hundreds" there on 30 November 1860. The town grew as a service-centre for the agricultural/pastoral hinterland between the Kakanui Mountains and the Waitaki River, and rapidly became a major port, starting construction of a breakwater in 1871. For many years there was a commercial and fishing harbour under Cape Wanbrow at Friendly Bay. With the development of pastoralism and the associated frozen-meat industry having its historical origins in New Zealand just south of the town at Totara, Oamaru flourished. Institutions such as the Athenaeum and Waitaki Boys' and Waitaki Girls' High Schools sprang up. The locally plentiful limestone (Oamaru stone) lent itself to carving and good designers, such as Thomas Forrester (1838-1907) and his son J.M. Forrester (1865–1965), and craftsmen utilised it. By the time of the depression of the 1880s Oamaru had become the "best built and most mortgaged town in Australasia". A major factor in the near bankruptcy of Oamaru was construction of the "Borough water race", an aqueduct completed after 3 years work in 1880. This major engineering feat replaced the previous poor water supply (obtained from the local creeks) with abundant pure water (and energy for industrial machinery driven by water motors) from the Waitaki river and conducted water in an open channel for almost 50 km through hilly farmland from Kurow to the Oamaru reservoir at Ardgowan until decommissioned and abandoned in 1983. Development slowed, but the population continued to grow until the 1970s. With the closure of the port and the New Zealand economy stalled, Oamaru found itself hard hit. In response it started to re-invent itself, becoming one of the first New Zealand towns to realise its built heritage was an asset. A public art museum, the Forrester Gallery (whose first curator in 1882 was Thomas Forrester), opened in 1983 in R.A. Lawson's neo-classical Bank of New South Wales building. Restoration of other buildings also took place. The Oamaru Whitestone Civic Trust was formed in 1987 with a vision of redeveloping the original commercial and business district of Oamaru's Harbour and Tyne Streets, and work began on restoring the historic precinct beside the port, perhaps the most atmospheric urban area in New Zealand. By the early 21st century, "heritage" had become a conspicuous industry and today[update], the number of buildings owned by the Oamaru Whitestone Civic Trust had grown from the original eight to 17. Oamaru contains over 70 buildings registered as Category 1 or 2 Historic Places in Heritage New Zealand register. The Köppen-Geiger climate classification system classifies the climate of Oamaru as oceanic (Cfb). Many of the early works of Janet Frame, who grew up in the town, reflect Oamaru conditions and Oamaruvians. Other literary associations include those with Owen Marshall, Greg McGee and Fiona Farrell Poole. Other prominent persons born and educated in Oamaru include Des Wilson, founder of the UK homelessness charity, Shelter; Australian Prime Minister Chris Watson; New Zealand politicians Arnold Nordmeyer and William Steward; Cardinal Thomas Stafford Williams; Sir Malcolm Grant, former President and Provost of University College London and subsequently Chairman of NHS England and Chancellor of the University of York; and notably former All Blacks rugby union captain Richie McCaw. Fred Allen, an All Black of the 1940s who went on to coach the All Blacks to 14 wins from his 14 tests in the 1960s, was born in Oamaru, though not educated there. The world first learned of the death of Robert Scott and the members of his team on their return from the ill-fated expedition to the South Pole by way of a cable sent from Oamaru, on 10 February 1913. From the 1920s to the 1940s Frank Milner (1875–1944) turned Waitaki Boys' High School into one of the most admired schools in the country through his old-fashioned values, inspiring leadership and broad outlook. Notable students include Charles Brasch (1909–1973) at Waitaki 1923 – 1926, a poet and patron of artists; Douglas Lilburn (1915–2001), "the elder statesman of New Zealand music"; James Bertram (1910–1993), writer and academic; Denis Blundell, a future Governor-General of New Zealand; and Ian Milner (1911–1991), the Rector's son, a Czech and English scholar falsely accused of spying for Communism. His father, known as "The Man", died suddenly on 2 December 1944 while speaking at the opening of a stone gateway to Milner Park, Oamaru. E.A. Gifford (1819–1894), an artist and Royal Academician, lived in Oamaru from 1877 to 1885 and from 1892 until his death. A genre, portrait and landscape painter he established a national reputation. The art world remembers him for works like his Auckland from the Wharf of 1887, probably the best-known image of 19th-century Auckland. Emily Gillies, a 19th-century Oamaru artist, was the daughter of C.H. Street, maternal niece of Edward Lear (1812–1888), the famous English watercolourist and writer of humorous verse. Lear's sister had virtually brought her brother up. When he died childless before her she inherited his residuary collection. The internationally significant group of works came to North Otago, where it remained intact until the early 1970s. The artist Colin McCahon (1919–1987) lived in Oamaru in 1930–1931, attending the Middle School. The place and the North Otago landscape made an impression on him. He revisited the area several times as an adult on painting trips. Cartoonist John Kent, who authored the Varoomshka comic strip for The Guardian newspaper in England, hailed from Oamaru. A strong community of living artists exists[update], and many dealer galleries have premises in the historic precinct. One of the town's principal living artists, Donna Demente, produces portraits and masks. At least partly through her work Oamaru hosts an annual mask festival each July, the "Midwinter Masquerade". Another annual celebration, a Victorian Heritage fête, takes place in November. Other noted former Oamaruvians include broadcaster Jim Mora and hockey player Scott Anderson. David Sewell played one test match for the New Zealand cricket team. Video game designer Dean Hall grew up in Oamaru and attended Waitaki Boys High School. His interest in mountaineering was fostered while on a geography field trip while studying there, ultimately culminating in him summiting Mount Everest in May 2013. Many public buildings use as their construction material the local limestone (quarried especially near Weston) and known as Oamaru stone. The Victorian precinct in southern part of Oamaru's main commercial district ranks as one of New Zealand's most impressive streetscapes due to the many prominent 19th century buildings constructed from this material. Several key historic buildings in the area centered around Harbour Street and the lower Thames Street, Itchen Street and Tyne Street have been preserved by the Oamaru Whitestone Civic Trust as part of a historic precinct. 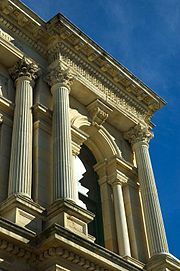 The great palladian St Patrick's Basilica is also a fine example in white Oamaru stone. The Victorian theme has been embraced by local shops and galleries in this part of Oamaru in terms of shopfittings and decor. Further enhancing the "olden days" feel of the precinct are several arts & crafts shops, a transportation museum, an antique furniture shop, and traditional businesses such as book shops, antique clothing shops, and a book binder. Many of the buildings in this area close to the harbour used to serve as commercial warehouses and stores and now provide large spaces for galleries such as the Forrester Gallery, the Grainstore Gallery, The Libratory and Steampunk HQ. Even the playgrounds in the harbour area continue the Victorian/industrial steam theme with a giant Penny Farthing structure supporting the swings, and several Steampunk-styled playground features. In August 2016 Oamaru made it into the Guinness Book of World Records for the largest gathering of steampunks in the world, a term that was coined in the 1980s and is based on imagining inventions the Victorians might have created for the modern world. Most of the streets in Oamaru take their names from rivers in England, particularly rivers in the northwest and southeast of the country. The main modern retail and commercial areas line Thames Street; State Highway 1 running south follows Severn Street, whereas historic commercial buildings dominate the area around lower Tyne Street. A colony of little blue penguins lives in a disused quarry on the harbour not far from the historic precinct. The penguins established themselves in the early 1990s, once the rock quarry had been closed in the 1970s, and in 1992 a group of volunteers started to help make the area suitable as a breeding habitat for the penguins and provide guided tours. Apart from the success of the penguin colony, their efforts were rewarded with the colony receiving the Otago Regional Council's Environmental Award in 1995. Over the course of the early 2000s, a visitors' centre and two grandstands were completed, and today the Oamaru Blue Penguin Colony is Oamaru's largest tourist attraction, receiving over 75,000 visitors annually. It is owned by the Waitaki District Council and carefully managed by the Waitaki Development Board, including monitoring and comparing of behaviour and numbers with a similar penguin colony nearby which is not open to visitors. A steam train operated by the Oamaru Steam and Rail Restoration Society runs between a small railway station in the historic precinct and a terminus at the harbour close to the little blue penguin colony on Sundays. Further south just outside town, a colony of yellow-eyed penguins at Bushy Beach also attracts ecotourists. Penguins sometimes live under buildings close to the beach, including the town's music club, The Penguin Club. The North Otago Tree Planting Association, inaugurated by local Oamaru G.P. Dr. Eric Strawson Stubbs and North Otago farmer Mr. Syd Hurst in 1937, was a forerunner of the New Zealand Farm Forestry Association. Oamaru serves as the eastern gateway to the Mackenzie Basin, via the Waitaki Valley. The Oamaru Telegram is published every Tuesday and is the only paper produced, printed, published, and based in Oamaru. The Oamaru Mail, published on Fridays, has its base in Dunedin with an office in Oamaru. The Waitaki Herald is delivered on Wednesdays. 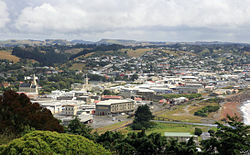 The town is within the coverage area of Radio Dunedin and within the circulation area of the Otago Daily Times, based in Dunedin. Oamaru has its own community television station, "45 South Television", which transmits from Cape Wanbrow on UHF Digital channel 34, and an independent commercial radio station Radio Waitaki 104, which has studios based in the former Radio New Zealand building on Thames Street, and transmits from Cape Wanbrow. Oamaru is the end point of the Alps to Ocean Cycle Trail from Aoraki/Mount Cook, a cycle trail constructed following approval in 2010 by the New Zealand Cycle Trail project. The trail terminates at Friendly Bay, adjacent to Oamaru's Victorian Historic Precinct. Oamaru Airport is 20 kilometres (12 mi) north of the town at Pururi. After Air New Zealand Link ceased operations in 2010, scheduled flights between Oamaru and Christchurch resumed in 2014 with Mainland Air. However they were short lived and were terminated after a few months. The main south line of the South Island Main Trunk Railway leads through Oamaru. A short side track connects Oamaru's historic precinct and a disused quarry at the harbour, with a tourist steam train running on Sundays. The 1900 railway station has been listed NZHPT Category II since 1983. It is a standard class B station, of weatherboard and corrugated-iron. There are three secondary schools in Oamaru. Waitaki Boys' High School is a secondary school for boys located in the northern part of Oamaru, with day and boarding facilities, and was founded in 1883. As of 2012[update], it has a school roll of just under 500. Waitaki Girls' High School is a state high school for girls. It was founded in 1887, and presently has a roll of just over 400 girls from the ages of 13 to 18. It also has a boarding hostel which houses approximately 50 girls, including international students and tutors. St. Kevin's College, Oamaru (founded 1927) is a coeducational state-integrated Catholic day and boarding high school with a roll of about 450. St Joseph's School was established by the Dominican Sisters and the Christian Brothers. It is the only Catholic primary school in North Otago. As of 2012[update], it has a roll of just over 200 and it caters for students up to Year 8. There are no longer any Sisters or Brothers on the staff and the school is run and managed by lay people. Other primary schools in Oamaru and the surrounding areas include North School, Fenwick School, Weston School, Ardgowan School, Oamaru Intermediate School and Totara School. Janet Frame fictionalised the Oamaru of her childhood as "Waimaru". Some of Fiona Farrell's literary works also feature Oamaru. Peter F. Hamilton's novel The Dreaming Void (London: Macmillan, 2007; ISBN 978-1-4050-8880-0) refers to " ... the backwater External World of Oamaru" (page 22). The same author's science-fiction novel Great North Road mentions a remote camp called Oamaru, set up in the unexplored remote continent of Brogal on the Sirius-system planet St Libra in the year 2143. 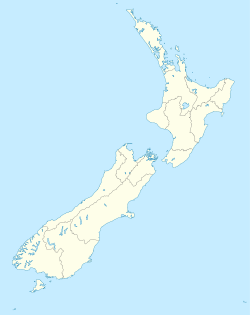 ^ "Council (Waitaki District Council)". Waitaki.govt.nz. Retrieved 20 January 2016. ^ Jill Hamel, 'The Archaeology of Otago', Department of Conservation, Wellington, 2001, pp. 16,18,22&82. ^ Atholl Anderson, The Welcome of Strangers, Otago University Press, Dunedin, 1998, pp. 90 & 107. ^ Ian Church, Otago's Infant Years, Otago Heritage Books, Dunedin, 2002, p.48. ^ A.H. McLintock (ed), 'An Encyclopaedia of New Zealand', Government Printer, Wellington, 1966, vol 2 p.705. ^ Richard Greenaway "Limestone Buildings of Oamaru" in Frances Porter (ed) Historic Buildings of New Zealand South Island Methuen, Auckland, 1983, ISBN 0-456-03120-0, p.143. ^ "History of the Oamaru Whitestone Civic Trust". Oamaru Whitestone Civic Trust. Retrieved 3 April 2014. ^ "Historic Places Trust New Zealand - Search the Register". New Zealand Historic Places Trust. Retrieved 3 April 2014. ^ a b "Climate: Oamaru - Climate graph, Temperature graph, Climate table". Climate-Data.org. Retrieved 6 December 2013. ^ McNeilly, Hamish (15 August 2012). "Game's success dazes designer". Otago Daily Times. Retrieved 17 September 2012. ^ Ryan, Rebecca (31 May 2013). "Living Everest dream". Oamaru Mail. Retrieved 16 October 2013. ^ "Oamaru's Victorian Precinct". What to See and Do (NZ Regional Promotions). Retrieved 21 February 2014. ^ "Oamaru's Victorian Precinct - 101 Must-Do's for Kiwi". New Zealand Automobile Association. Retrieved 21 February 2014. ^ "Trust Buildings". The Oamaru Whitestone Civic Trust. Archived from the original on 20 June 2014. Retrieved 21 February 2014. ^ "Precinct Attractions". The Oamaru Whitestone Civic Trust. Retrieved 21 February 2014. ^ "Sights in Oamaru". Lonely Planet. Retrieved 21 February 2014. ^ "Oamaru's New Friendly Bay Playground Officially Opened". Victorian Oamaru, Pen-y-bryn Lodge, 11 Oct 2013. Retrieved 21 February 2014. ^ "How an ordinary New Zealand town became steampunk capital of the world". The Guardian. 30 August 2016. ^ "The history of the Oamaru Blue Penguin Colony". Oamaru Blue Penguin Colony. Retrieved 21 February 2014. ^ "About the Oamaru Blue Penguin Colony". Oamaru Blue Penguin Colony. Retrieved 21 February 2014. ^ "Running Days - Oamaru Steam & Rail". Oamaru Steam and Rail. Retrieved 21 February 2014. ^ David Bruce (22 August 2014). "Mainland flights to end". Otago Daily Times. Retrieved 1 June 2016. ^ "Search the List - Oamaru Railway Station (Former) - Heritage New Zealand". www.heritage.org.nz. ^ "Rail Heritage Trust of New Zealand - Oamaru Station". www.railheritage.org.nz. ^ "125th anniversary to be 'momentous' occasion". Otago Daily Times. 21 June 2008. Retrieved 7 January 2012. ^ "Waitaki Boys' High School". Ministry of Education. Retrieved 6 January 2012. ^ "History of Waitaki Girls' High School". Waitaki Girls' High School. Archived from the original on 24 May 2010. Retrieved 6 January 2012. ^ "Waitaki Girls' High School". Ministry of Education. Retrieved 6 January 2012. ^ "Schools". Catholic Diocese of Dunedin. Archived from the original on 1 May 2012. Retrieved 6 January 2012. ^ "St Joseph's School (Oamaru)". Ministry of Education. Retrieved 6 January 2012. ^ Hamilton, Peter F. (2012). Great North Road. Tor UK. ISBN 9781743298381. Retrieved 8 June 2013. Wukang was the first of the three projected forward camps, arranged almost like compass points, north-west, due north, and north-east from Sarvar, which was now being relegated to supply-base status. Varese, the camp due north, was already having its landing strip bulldozed; while Oamaru, away to the east, had just received its first successful Berlin landing yesterday. No more forward camps were scheduled — this was as far as the expedition was going to venture, as far as the budget would take them. ^ "Devizes and District Twinning Association". www.devizes-twinning.org.uk. McLean, Gavin (2008). Kiwitown's Port: The Story of Oamaru Harbour. Dunedin, NZ: Otago University Press. ISBN 9781877372636. Sorrell, Paul; Warman, Graham (2014). Oamaru: New Zealand's Living Victorian Town. Auckland, NZ: Penguin. ISBN 9780143569688. (soft-bound). McDonald, K.C. (2006). Oamaru 1878 A Colonial Town. Oamaru: Waitaki District Council (1878 Publication group). ISBN 0-473-11095-4. Wikivoyage has a travel guide for Oamaru. Wikimedia Commons has media related to Oamaru.